Newcastle United’s imminent new arrival Ayoze Perez is taking a huge risk by snubbing Porto and moving to St James’ Park – according to ex-Magpie flop Albert Luque. United have moved quickly to tie up a £2million deal for Perez, who is on the brink of signing a five-year-contract to join the Magpies. 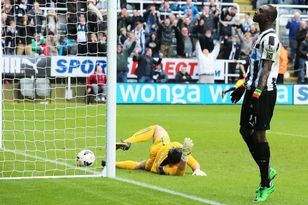 There was also interest from Arsenal, Swansea, Everton and Portuguese giants Porto, but Newcastle nipped in first. Sources in Spain confirmed the transfer yesterday afternoon, with Perez having passed a medical and agreed terms with Newcastle in the last 48 hours. There are still some formalities to be completed and Tenerife are pushing to delay an official announcement until they have completed their season in early June. It is a blast of positivity and United recruiting such an exciting prospect should be viewed as encouraging after the way last season tailed off – but the signing comes with a warning from Spain from Luque. The £9million signing endured an unhappy spell at Newcastle, making just 21 appearances despite arriving as a much-heralded attacking option. A combination of injures, a failure to adapt to the Premier League and home sickness made it difficult for him to make the impact that he should have done, and the forward feels that Perez is taking a huge risk by making the same switch. He reckons that a safer option for Perez – although possibly not more lucrative – would have been signing for Porto. “The two years I spent there were the two worst on a personal level,” he told Teide Radio. It is true that Newcastle will need to make sure that Perez, who still lives with his parents in the Canary Islands, will need to be nurtured and looked after by United if they are to see him fulfil his potential, but Luque’s words of caution should be taken with a pinch of salt. While Marcelino and Xisco also struggled, it is not correct that Spanish players are destined to fail at St James’ Park. For a start, United took Jose Enrique to their hearts before he left for Liverpool, with the left-back given time to mature into one of the best defenders in the division. But there is some sense in what he says about the tumultuous environment that surrounds the club. Luque’s warning about it being a “difficult” move is probably a fair one. “The club is financially very healthy but every two years they want to start over again and they have a never-ending need to change things,” he said. “The contract that he has got will have delighted him but it is a difficult place to go. All three of the Spanish players who have gone there were warned that it was a difficult move and none of the Spaniards were a success. Meanwhile, Tim Krul has told United’s official website that he is “positive” about his chances of making Holland’s World Cup squad. Krul is one of four goalkeepers who has been picked by Louis van Gaal for the finals in Brazil and is hoping for the call next week. “It’s difficult to say and I don’t want to tempt fate, obviously,” he said. “I’ve played a lot of games for Newcastle this season and haven’t had the sort of injury problems that I had last year, so that has been a positive, but you just never know. “There a lot of good goalkeepers in Holland going for those three places and it seems like everything is still open.